I hate paper money. Not greenbacks*, but rather the pink-backs, white-backs, blue-backs or whatever color money it is that comes with a particular game. Inevitably, they get bent, torn or mutilated. Then, you are playing a great game with one of the major components in nasty shape. I am talking here about the aesthetics of playing a game. Casual gaming with friends and family ought to be a great experience, not just competition. Having nice components is like having great glassware – always using the same paper money for a great game is like always drinking wine from the same paper cup. Let’s get out the glassware after all! This is not without its drawbacks, however. There are three issues in using poker chips that you can easily deal with, if not just ignore. I will briefly talk about them, and then help you get around them. The first thing that comes to mind is the number of different bills used. Monopoly for example, has denominations of 1, 5, 10, 20, 50, 100 and 500. That’s seven different denominations. 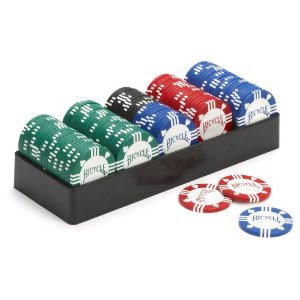 My poker chip set has four colors; I have seen sets with five. Thinking about it though, is there really a need for all of that variety in Monopoly? With a decent quantity of four colors of chips, you could easily play with denominations of 1, 10, 100 and 500. Maybe 1, 10, 50 and 500 would be better. With five colors, you get the best of both: 1, 10, 50, 100 and 500. I cannot imagine that dropping the 5’s and 20’s will make much difference. Another minor issue is the fact that everyone can see how much money you have. In some games, that’s open information that everyone can see, in other games that information is closed. Many times, that information can be played either way; players decide before starting. If it needs to be hidden, screens can be made to hide poker chips, though that requires work that I am not willing to put forth. (And remember that I make tuckboxes!) A simpler alternative is to hide some of the chips in one hand. My personal favorite is just to mix them up so that they are hard to count from across the table. No matter the solution, it really isn’t a major issue. Originally, I thought that assigning them in patriotic order would be a great mnemonic for American players, but it wasn’t. I ended up remaking the player aid that comes with the game. My version of the player aid has monetary information right on it, giving each player a reminder right in front of them. I will add one more thing. I had plastic poker chips I inherited from my parents. I found heavier clay chips on sale, and replaced the plastic ones in the poker chip carousel I have. The heavier chips just feel better. They are worth the minor expense, particularly since there are so many games that can use them. Do yourself a favor and try poker chips. Break out the wine glasses. I am confident that it will make a better experience for everyone at the table, even when you are playing poker. And when you play poker, don’t invite me. Thanks, but one of my former hobbies is card magic, and for some reason I always get accused of cheating! * For those of you from countries other than the United States (a whopping 20% of you!) and aren’t familiar with the term greenbacks, it is a nickname for the US dollar. For the hidden money issue, I went to my local craft store and found unpainted small wooden boxes with hinged lids that look like little chests. I went along with a handful of chips so I could check size in the store. They work great, and look neat as well. That's a great idea! I watched that video a few months back, and it was part of my decision to buy chips. It would benefit everyone reading to see Scott's video, and to check out is other videos in the series.